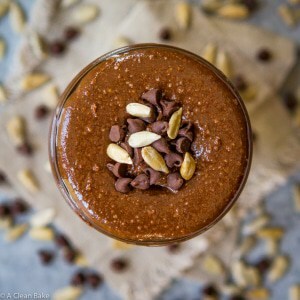 Chocolate sunflower seed butter is a nut-free version of Nutella! This homemade version is completely sugar free, gluten free and dairy free. Peanut butter and jelly should probably watch its back because as far as Best Nut/Seed Butter and Fruit Flavor combinations go, chocolate sunflower seed butter and apple slices give it a serious run for its money. Does that sentence not make much sense to you? 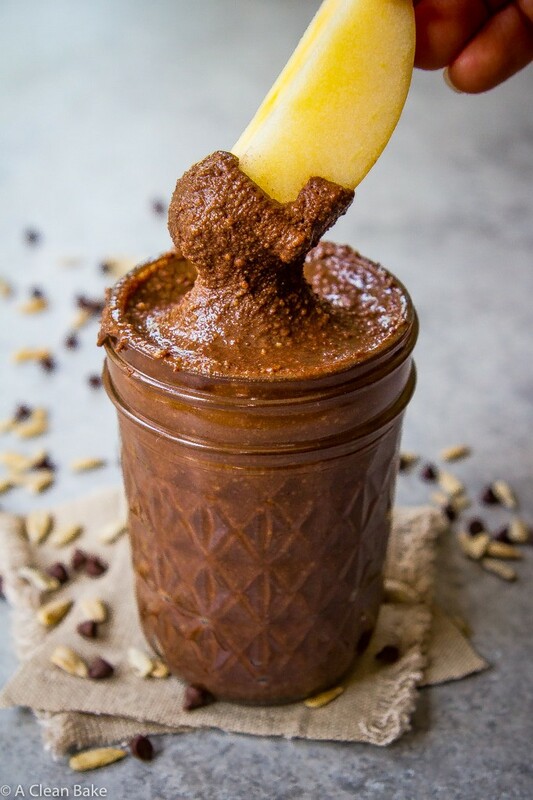 Ok, no problem: just go make a batch of this sunflower seed butter, then dip an apple slice in it and come back. Yeah. 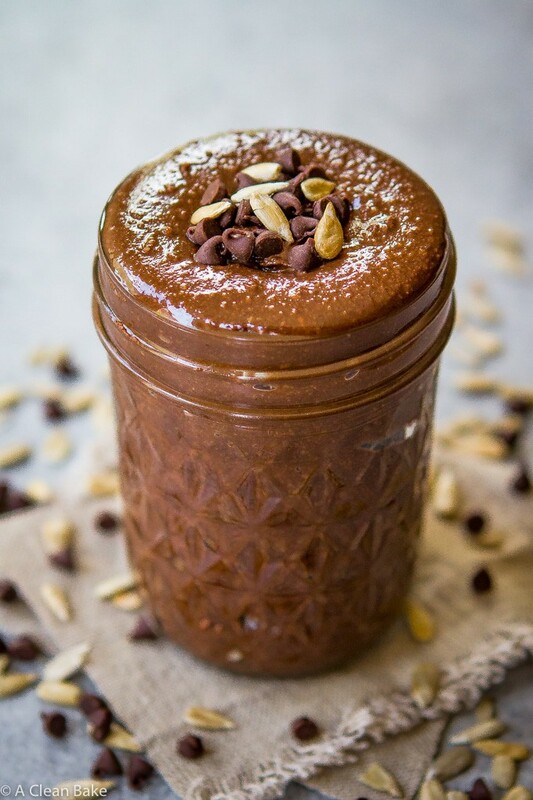 It’s basically a nut-free homemade Nutella. This whole discovery was an fateful accident when I went to make caramel cashew butter, only to find that I was out of cashews (so switched to sunflower seeds, because I had a big bag from NOW Foods on hand), and then the caramel kind of seized up into this tasty, but weirdly textured, nut buttery wallpaper paste. Yes, that that consistency is a deal breaker for me too. Also, caramel is good but chocolate, let’s face it, is always better. So anyway, back to the sunflower seed butter itself. It’s that magical kind of recipe that I like and – in the absence of more than 20-30 minutes to cook a dish these days – mostly post lately: few ingredients, little time, easy method, maximum flavor. 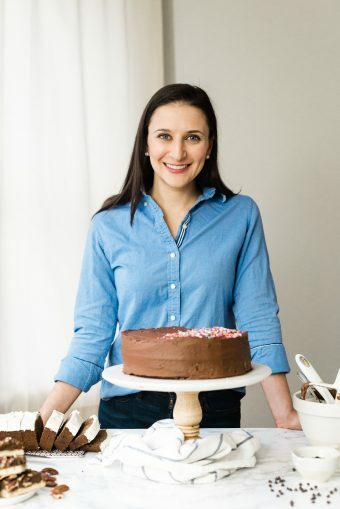 Also, all the “frees”: gluten free, vegan/dairy free, paleo/grain free, egg free, nut free, sugar free… But eating it feels decadent and indulgent – not like it’s “health food”. Speaking of sugar free, I tried a new granulated stevia blend product for this recipe: NOW Food’s Sugarless Sugar baking sweetener. It’s not pure granulated stevia, but it is a 1:1 replacement for sugar, so if you prefer you can use coconut sugar in this recipe (since I know many people prefer it to stevia!). 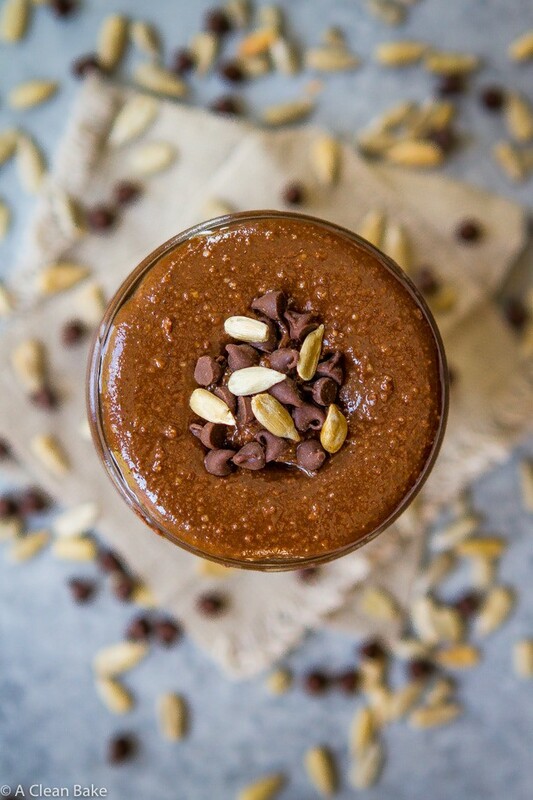 Pulse the sunflower seeds in a high speed blender, such as a Vitamix, starting at low and gradually increasing the speed until they reach a course flour consistency, then a gummy ball. Add the coconut oil, and continue to process, increasing speed to medium or medium/high until the sunflower seeds liquify. The mixture should be quite runny. Add the cocoa powder, sweetener, vanilla, and salt and process to combine. Throughout this process, you'll need to stop frequently to scrape down the sides of the container (to make sure all ingredients are getting incorporated) and loosen the mixture from the bottom of the container. Don't let it clump around the blade too much, which strains your machine's motor. Continue to process until smooth. Taste and add more sweetener, if you prefer. If you don't have a high speed blender, you can do this in a food processor. Store leftovers in an airtight container at room temperature for up to a week, or in the fridge for up to 2 weeks (or more).